The Russian Agency for Support and Coordination of Russian Participation in International Humanitarian Operations (EMERCOM) became a UN-SPIDER Regional Support Office on 19 June 2013 signing the agreement on the sidelines of the 56th session of COPUOS. 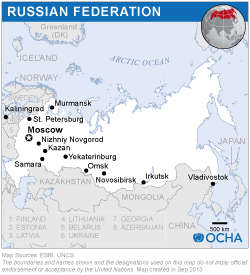 EMERCOM is the Ministry of the Russian Federation for Civil Defense, Emergencies and Elimination of Consequences of Natural Disasters established on 27 December 1990. Its main tasks include working-out and implementation of the state policy in the field of civil defence, protection of population and territories against emergencies, providing fire safety and the protection of people on water bodies within the competence of the Emergency Control Ministry of Russia.